A strong collection of tracks ideally suited to images of forward motion, high-activity, positive outcomes and well-placed energy. Driven by down-to-earth guitars, both acoustic and electric, and tasteful, supporting percussion and rhythm instruments, these tracks will help you bring out the best in characters, situations or outcomes. 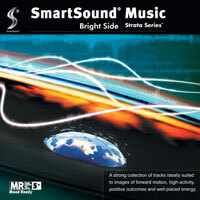 The textures particularly lend themselves to SmartSound's powerful Mood capabilities.